he band's sound incorporates elements from some of the more vibrant trends indie pop has produced over the last 20 years. Kind of lo-fi and kind of punk, the band contrasts innocent, airy vocals with a strong bass sound that's danceable and catchy. The bridges are creative, the lyrics clever--a little emo, a little ironic. Then there's the striking and stylish lead singer, Casey Schumacher, whose New York punk fashion ethos, confidant stage patter and vocal style are reminiscent of Yeah Yeah Yeah's lead singer Karen O. These ingredients, combined with the band's occasionally jarring experiments in atonality, result in a sound that's like no other in Reno. 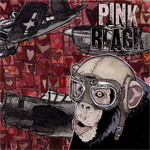 he first CD from Pink Black, on their own label, Bicycle town.